Although Williams went on to an active career in Michigan, where he lived after his 1969 return to the U.S., the memo reflected the important role Williams played in the Black Freedom Struggle from the mid-1950s through 1969. Robert F. Williams’s career as a civil rights advocate and Black Power pioneer is well-documented in his personal papers, now a part of the ProQuest History Vault, Black Freedom Struggle in the 20th Century, Organizational Records and Personal Papers, Part 2. Williams became active in the freedom movement in Monroe, North Carolina. By 1957, Williams was president of the Monroe, North Carolina, NAACP branch. The branch had only a handful of members initially, but, by 1959, under Williams’s leadership, they grew to almost 200 members. In the spring of 1959, in the midst of a wave of violence throughout the South, a white railroad engineer in Monroe, B. F. Shaw, was charged with attacking an African American maid at a hotel. On the same day Shaw’s trial, another assault case involving a white man, and a black woman took place in Monroe. When the charges against Shaw were dismissed and the man in the other case was acquitted, an enraged Williams said to reporters and that it was time to “meet violence with violence.” This statement thrust him into the national spotlight; the NAACP also expelled him from the organization. Williams had also begun publishing a newsletter called The Crusader, which became Robert F. Williams’s primary mouthpiece. 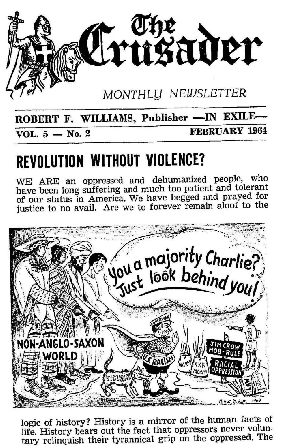 The mission of The Crusader was “Advancing the cause of Race Pride and Freedom.” ProQuest History Vault includes a complete run of The Crusader newsletter, with issues from 1959-1969, as well as 1980-1982. In its beginning , the newsletter focused on local Monroe stories, but later it included items about the civil rights movement, and national and international news. His regular column involved topics like his philosophy of armed self-defense or other issues of the day, such as the Vietnam War, Muhammad Ali, or the Republic of New Africa. Two years after Williams’ expulsion from the NAACP, in the midst of Freedom Rides protests in the Monroe area, a white couple became lost and ended up in the middle of the demonstrations. Williams rescued the couple and brought them to his house, but was later charged with kidnapping. Williams fled from Monroe, making his way to Cuba. From 1961 to 1964, Williams lived in Cuba, where he broadcast a radio program called “Radio Free Dixie” back to the United States. The Williams Papers in History Vault include a nearly complete series of transcripts from his radio show. In 1965, Williams and his family left Cuba, relocating to Beijing. While in China, Williams dined with Mao Tse-tung, and many high-ranking Chinese leaders, and continued to develop his Black Power philosophy. In the late 1960s, as the Nixon administration began opening diplomatic relations with China, Williams bartered his knowledge of the Chinese government for safe passage home and a post at the Center for Chinese Studies at the University of Michigan. Upon his return to the U.S., Williams got involved in local politics in Michigan while maintaining an interest in national and international politics. 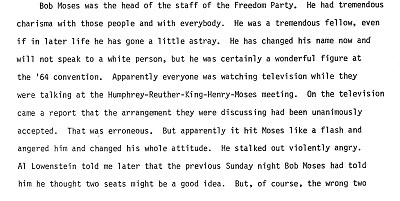 Williams’ extraordinary career, from his NAACP leadership in Monroe, to his time in exile in Cuba and China, and his activism after his return to the U.S. in 1969, are well documented in the Robert F. Williams Papers in ProQuest History Vault, Black Freedom Struggle in the 20th Century, Organizational Records and Personal Papers, Part 2. In addition, this newest History Vault module also contains the records of two of the most important civil rights organizations of the 1960s, the Student Nonviolent Coordinating Committee (SNCC) and the Congress of Racial Equality (CORE). Librarians: Learn more about the Black Freedom Struggle modules in History Vault and sign up for free trials of ProQuest History Vault modules. Or review the image gallery, here.